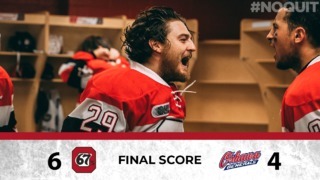 The Ottawa 67’s turned in a textbook road game on Tuesday night, holding the Hamilton Bulldogs to less than 20 shots in a 2-1 win for the Barber Poles. 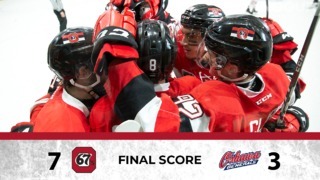 The 67’s, up 3-0 in the best-of-seven series, now head into Game 4 in Hamilton on Wednesday night with a chance to end the Eastern Conference Quarter-Final in four games. Noel Hoefenmayer’s second of the playoffs five minutes into the second period stood as the winner in a game that was a much tighter affair than the first two of the series and featured little of the extracurricular activities that punctuated Game 2. Mitchell Hoelscher also picked up his second of the post-season for Ottawa, while Bulldogs star Arthur Kaliyev scored his first of the playoffs to cut a 2-0 Ottawa lead in half. 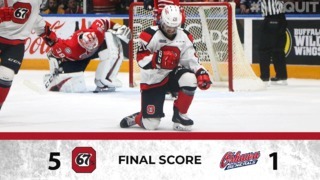 Though a strong defensive effort limited Hamilton’s scoring chances, 67’s goalie Mikey DiPietro stood tall when called upon, stopping 18 of 19 shots. 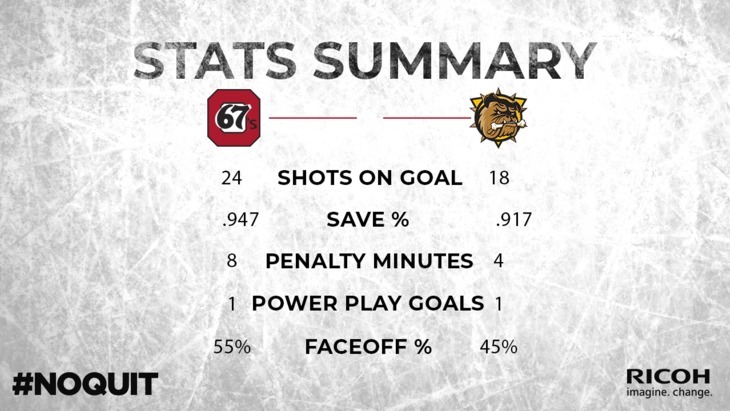 The 67’s have held the Bulldogs to fewer than 20 shots in two of the three games in this series. Lucas Chiodo extended his playoffs points streak to three games with an assist on Sunday and now has five points to start the post-season. Defenceman Merrick Rippon turned in another solid performance on the blueline while also chipping in with a game-high four shots on goal. The 67’s powerplay continued to click at 50 % or better, with Ottawa going 1-for-2 on Tuesday. Hamilton was 1-for-4 on the powerplay. Ottawa had a 29-24 edge in the face-off circle on Tuesday, the third-straight game the 67’s have led Hamilton in that category.